Always Mother’s Day weekend in Hotchkiss, Colorado. The Trials are conveniently located one block from downtown Hotchkiss in a scenic Hotchkiss family pasture. Friday the Nursery class and Novice classes run. Saturday and Sunday Pro-Novice and Open dogs show off their talents with a more difficult course to complete. During the lunch break each day, there will be an actual run taking place with the judge explaining each part of the run, including why points might be taken off the total score. 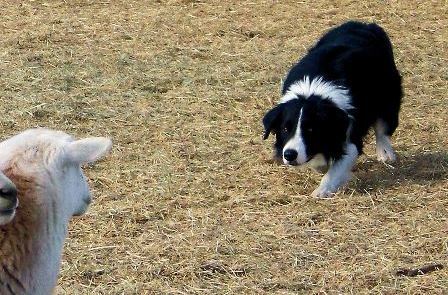 Sheep shearing demonstrations throughout Saturday will delight all spectators. Also, try your hand at spinning during the wool spinning demonstrations. 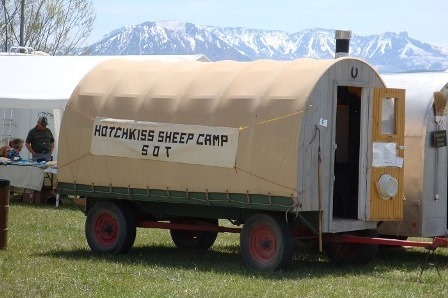 Sheep camp wagons on display will give an insight as to how the herder lives while tending the large flocks of sheep. Food and craft vendors, t-shirts, and other related items will be available throughout the 3 days. Other events happening during this weekend include: 1st State Bank of CO Customer Appreciation lunch, Hotchkiss/Crawford Historical Society & Museum, Antique Car Show, and All Roads Lead to Hotchkiss Yardsales. This is a weekend not to miss! !